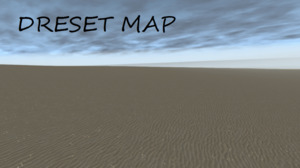 Nothing unique, it is just sand, for example, theres desert maps with hell lots of details, easter eggs etc. This, this is just sand. Lame version of Ghost's Desert, seriously this is awful. seems cool, maybe a town or something in the future, but nice to not kill a car on a tree 5 seconds after spawning. I'll be honest I didn't download this with high expectations. This just a waste of 62.7 MB. Add some stuff to it and maybe I'll change my mind.